Our Royal Suite is the most desirable in Golden Temple Hotel and is popular with honeymooners and couples celebrating an occasion such as an anniversary or birthday. 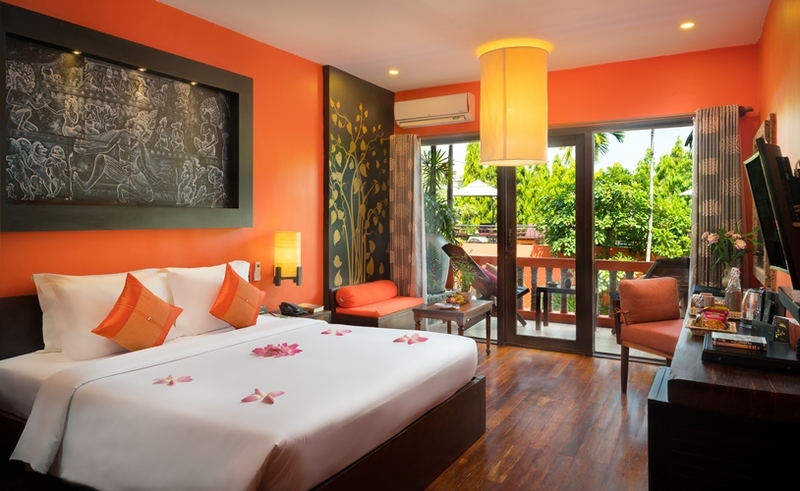 Located ground floor, the Royal Suite features king size bed and a spacious attached bathroom. Our 36 sqm Deluxe Pool View rooms are on the upper floors and feature a balcony with pool view. These luxury rooms have a comfortable king bed. Each is decorated in modern Khmer style, and is adorned with beautiful artifacts and stylish wood furniture and flooring that creates a warm relaxing ambiance. The 36 sqm Deluxe Poolside rooms are on the ground floor with pool access. Each offers king bed and ensuite shower area. 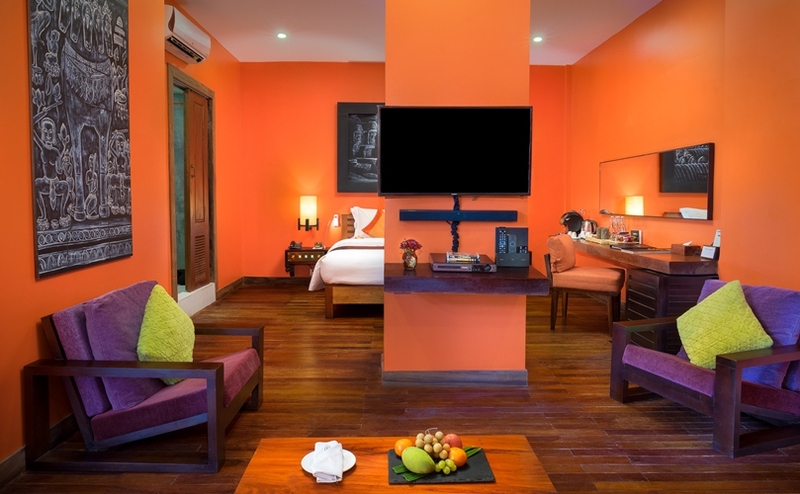 Each room is decorated in modern Khmer style, and is adorned with beautiful artifacts and stylish wood furniture that creates a warm relaxing ambiance. The Deluxe Urban rooms offer 38 sqm and are located on the upper floors. Each has a balcony, king bed and ensuite with shower area. Each is decorated in modern Khmer style, and is adorned with beautiful artifacts and stylish wood furniture and flooring that creates a warm relaxing ambiance. Our 36 sqm Superior Double rooms are on the upper floors and have a balcony, luxury king bed and ensuite with shower area. 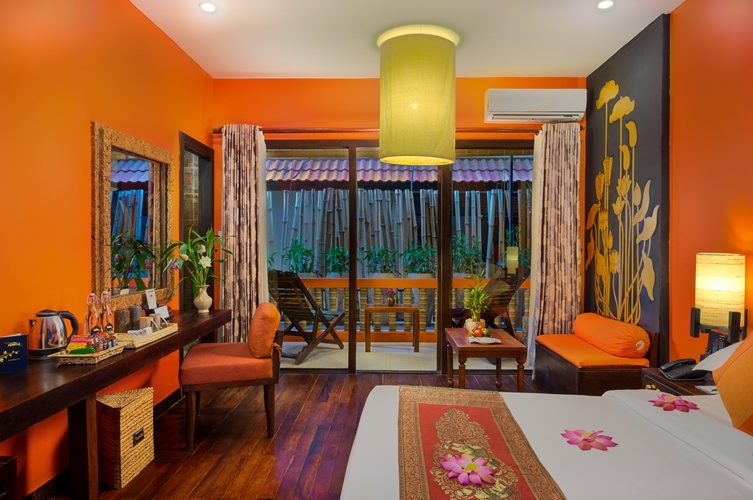 Each is decorated in modern Khmer style, and is adorned with beautiful artifacts and stylish wood furniture and flooring that creates a warm relaxing ambiance.. These 36 sqm rooms are on the first and second floors and have a balcony and ensuite shower room. 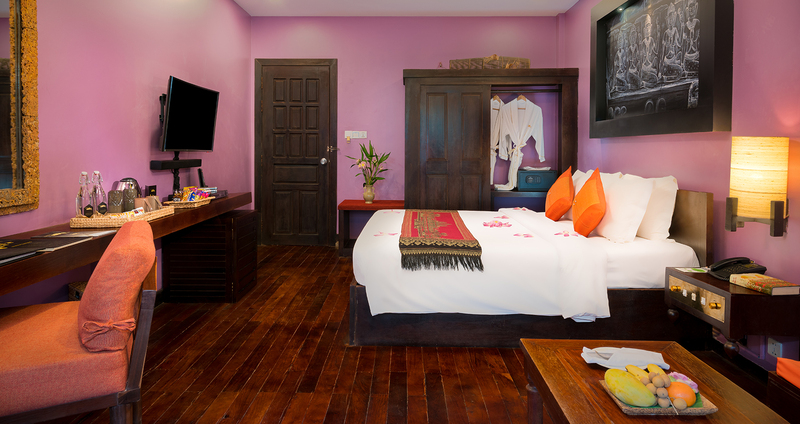 All our Superior Twin rooms exhibit Khmer inspired contemporary decor, with beautiful ornamental artifacts and stylish wood furniture. Wooden floors create an exceptional warm and comfortable ambiance.